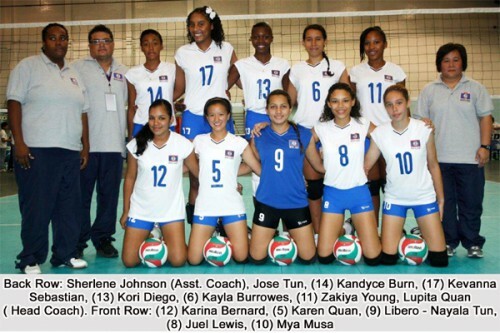 Returning to Belize on Saturday was the Belize Youth Female National Volleyball Team, after participating in the Central American Female Youth (U18) Volleyball Championship in Guatemala City, Guatemala last week. Belize finished the tournament with a 2-3 record, after losing their final game on Friday in straight sets to top seeded and now undefeated champions of the tournament, Costa Rica. In the tournament, which ran from September 2 – 6, Belize lost to Honduras (2-3), Guatemala (0-3) and Costa Rica (0-3); and we defeated El Salvador (3-1) and Nicaragua (3-1). “The young girls have made Belize proud with a gutsy performance, working hard, and providing a good result. The experience will be valuable as the results continue to improve with each competition and volleyball continues to grow. Despite not medalling in the tournament, our girls still took home a number of the individual awards which were issued at the end of the competition on Friday night at the Alfonso Gordillo Gym in Guatemala City. Costa Rica’s Allison Font was awarded prizes for being the Most Valuable Player, Best Spiker and Best Scorer; and her teammate Valeria Monge was Best Receiver. For Belize, captain Karen Quan was awarded Best Setter, Kevanna Sebastian was Best Blocker, and Nayala Tun received awards for both Best Defense and Best Libero. Host country Guatemala’s Christa Reinoso was awarded Best Service. The final standings for the Central American Female Youth Volleyball Championship 2013 were: 1st place Costa Rica; 2nd Guatemala; 3rd Honduras; 4th Belize; 5th El Salvador; and 6th Nicaragua.